We’ve had a summer of celebs wearing velvet, so it seems only logical that the tables have turned as we move into Fall. 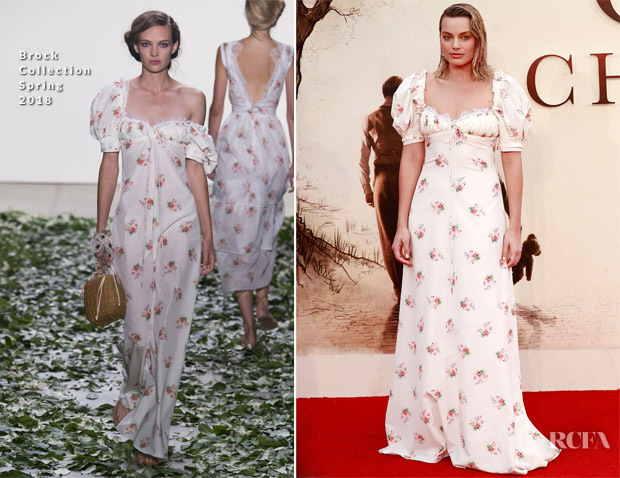 Margot Robbie was full of the joys of spring as she made her way onto the red carpet for the ‘Goodbye Christopher Robin’ world premiere this evening (September 20) in London. Floral-print dresses have slowly become a Brock Collection signature and this -fresh-off-the-runway- Spring 2018 prettily patterned ‘Doda’ dress is a fine example. 3. Find the dress too ‘Little House on the Prairie’. Personally, I love the romantic nature of the dress, and I think the hair keeps the look modern.